It's the weekend that wasn't. I'm exhausted. The show's open and we've had 2 successful nights so far! Well received, great audiences and a good performance. All in all I'm feeling good about it. 2 down, 3 to go! I made these little numbers this weekend. They're super quick to make but I've only been able to work on them in little 5 minutes increments. They look uneven, but I promise they're not. It's just the way I was holding my feet. 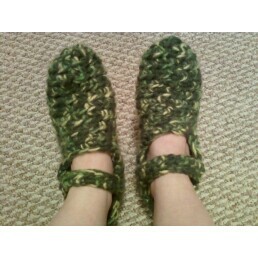 :) They're super warm and way comfy and soft.